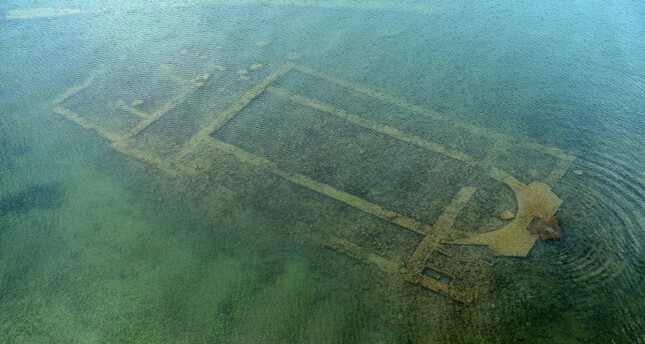 Bursa Metropolitan Municipality announced its plans to turn an underwater structure determined to be a 1600-year-old basilica to Turkey's first underwater archaeological museum in a written statement. “The aim of the work is not to remove the basilica from its place. People will be able to visit it through an underwater system,” İznik District Governor Ali Hamza Pehlivan said. Ancient Nicaea, modern-day Iznik, has central importance to the history of Christianity. It was the site of the first ecumenical council – the first effort to attain consensus in the Church through an assembly representing all of Christendom. The ancient basilica, which rests 1.5 to 2 meters below the surface was discovered while Turkish archaeologists were surveying the waters for any evidence of cultural heritage. Archaeologists believe that the structure collapsed during an earthquake in the region around 740 AD. Iznik Metropolitan Mayor Alinur Aktaş said that they were planning to build a 20-meter-high tower above the basilica and a museum to display the finds. "The tower will offer visitors the chance to view the area during the day and night. The excavation site will be open for divers. When the construction of the museum is complete, it will make a great contribution to tourism," Aktaş said.